ebb & flo bookshop is an independent bookshop based in the Lancashire market town of Chorley. We love books a lot. We support the shop local movement and want our bookshop to make an important contribution to the Chorley high street and community. Chorley is a Totally Locally town. When you buy books from us you are supporting a small independent business which pays fair taxes. You’re investing in your town. And you’re dealing with friendly humans in the real world, which is good for the soul. Tom Kerridge shows you how to be the boss in the kitchen and eat well every day, thanks to more than 100 brilliant recipes to give you and your family a fresh start. What’s for dinner tonight? Recycle that takeaway menu, step away from the microwave and make the most of the amazing British produce with some real home-cooked food from Tom’s BBC TV series!Tuck into a quick peanut chicken stir-fry or flavour-packed butternut squash and chickpea curry. At the weekend, Tom’s Greek-style roast lamb makes the perfect family feast, and why not get the kids involved in the cooking too?It’s very easy to fall into the busy-life trap, especially when ready meals are so convenient. But Tom Kerridge has learnt from experience how important it is to take control over what you eat for the sake of your health and happiness. Now he wants to show you how easy it is to cook amazing meals at home, whether you’re short on time or lack confidence in the kitchen. 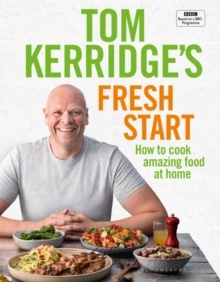 Tom Kerridge’s Fresh Start is not a diet book, but it is about taking control. Visit The Bees on Chorley Market to sample some of the recipes! This entry was posted in News, Regular Events on January 13, 2017 by Diane Gunning. Copyright © - ebb & flo bookshop | 12 Gillibrand Street, Chorley, Lancashire PR7 2EJ | Design by BWD Group | Login.